Hamburgers don't require a trip to a restaurant or a drive-through window to enjoy. Cooking your own burgers at home gives you complete control over the finished product from the thickness of the patty to the doneness of the meat. A home-cooked burger is also a quick option for a filling meal in a hurry. Ground chuck makes a good choice for burger meat because its fat content keeps the finished burger moist and juicy. Heat a skillet on the stove as you form the burger patties and prepare to cook them. A hot pan is essential for getting a good sear on the meat, and that sear is what gives a burger its flavor. Form the meat into 6 ounce balls, about 3 inches in diameter. A smaller burger has a larger surface-to-volume ratio, giving you more of the flavorful exterior to go with the juicy interior. Shape the balls into patties with loose pressure. Pressing the ground chuck too much will leave your burgers dense and rubbery, so use the minimal pressure needed to form a patty shape. Salt and pepper the patties on both sides just before cooking. Add just enough vegetable oil to the hot pan to coat the bottom of the skillet, about a teaspoon to a tablespoon depending on the size of your pan. Place the burgers in the pan without crowding them and let them cook for 2 to 4 minutes. Resist the temptation to press them, as that only squeezes out the juices. Flip the burgers and cook them for another 2 to 4 minutes on the other side. 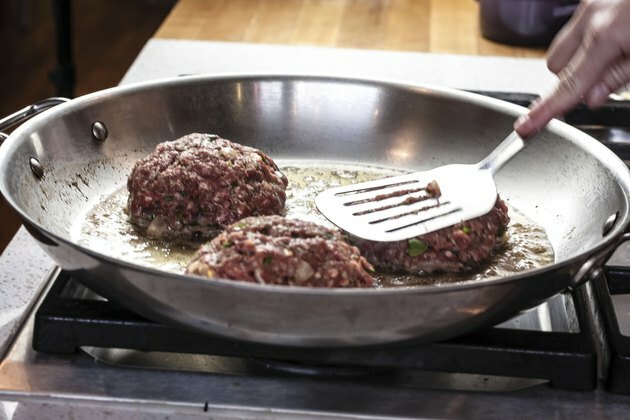 Check the burgers with a meat thermometer to ensure that their internal temperature has reached 160 degrees F. Ground beef, including high-quality chuck, must cook to this temperature for safety. Remove the burgers from the skillet and wrap them in foil to rest. Resting the meat is an essential final step in cooking because it lets the proteins in the meat re-absorb some of the liquid that cooks out of them, resulting in a juicier patty. Ground chuck contains as much as 25 percent fat, so balance this hefty calorie load with condiments and buns that round out the meal nutritionally. Pile the burger high with lettuce, tomatoes, mustard and onions and try a whole wheat bun. Don't rely on color to tell you when a burger's done. Pink meat may still be at a safe temperature, while browned centers don't necessarily indicate that the burger has reached the required 160 degrees.